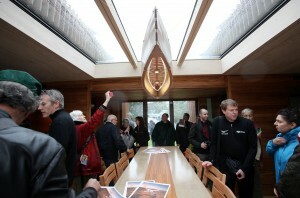 Sorry about delaying reporting the Solar Decathlon 2011. I was first under the weather, then because some of you have written me wanting better/more clear explanations of the Feed-In-Tariff/CLEAN program, I started to look around for software and other ways of presenting this topic. The end result may be viewed above, in this new clip. Let me know if it would do a better job in convincing people to sign the petition. Your comments and suggestions will be appreciated. New Zealand claimed second place with 95 points. 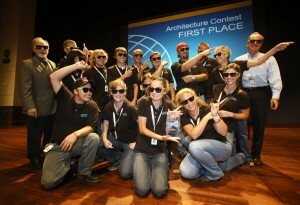 And Appalachian State University took third place with 94 points. 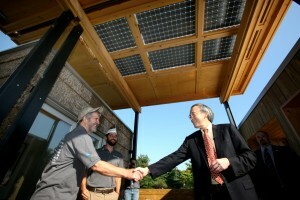 Appalachian State University's The Solar Homestead design: bifacial PV panels, U.S. Energy Secretary Steven Chu speaks with Jeffrey Tiller )Chair of Technology & Environmental Design Dept.) and student David Lee. For the Architecture Contest, the jury evaluated the houses on these criteria: architectural elements (including the scale and proportion of room and facade features, indoor/outdoor connections, composition, and linking of various house elements; holistic design (comfort for occupants and compatibility with the surrounding element);lighting (integration and energy efficiency of electrical and natural light);inspiration (design that inspires and delights Solar Decathlon visitors);documentation (including drawings, project manual, and an audiovisual architecture presentation accurately reflecting the project on the competition site). 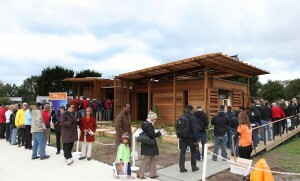 The U.S. Department of Energy Solar Decathlon 2011 is an award-winning program that challenges collegiate students from around the world to design, build, and operate solar-powered houses that are affordable, highly energy efficient, attractive, and easy to live in. 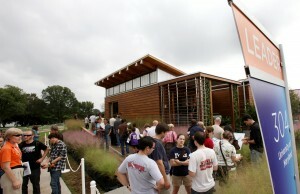 The Solar Decathlon has been providing participating students with hands-on experience and unique training that prepares them to enter clean energy workforce, supporting the President Obama’s Administration’s goal of transitioning to a clean energy economy while saving families and business money. More video clips on University of Maryland’s Watershed design, New Zealand’s First Light design, and Appalachian State University’s Solar Homesteadwill be seen/posted later. 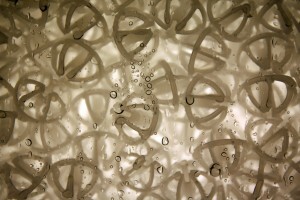 This entry was posted on Wednesday, September 28th, 2011 at 6:09 AM	and is filed under Educational, Events, Workshops. You can follow any responses to this entry through the RSS 2.0 feed. You can leave a response, or trackback from your own site.